Jamestown Settlement is a name sometimes used to describe the first permanent English settlement in North America, established at Jamestown in the Virginia Colony on May 14, 1607. In modern times, Jamestown Settlement is also promotional name used by the Commonwealth of Virginia's portion of the historical attractions at Jamestown. It is adjacent and complementary to the Historic Jamestown attraction at Jamestown Island. Recreated Powhatan village at the Jamestown Settlement. In December 1606, 108 men set sail from England with a charter from the Virginia Company of London to establish a colony in the Chesapeake Bay region of the New World. After a particularly long voyage of five months, the three ships under Captain Christopher Newport made their first landing at a place they named Cape Henry in April, 1607. They were under orders to select a more secure location, and after setting up a cross, and giving thanks for solid ground, they set about exploring Hampton Roads and a tributary they named the James River, in honor of their king, James I of England. On May 14, 1607, they selected Jamestown Island on the James River about 40 miles (62 km) inland from the Atlantic Ocean and the entrance to the Chesapeake Bay. The location was chosen due to the deep water surrounding the island and because it was a strategic defensive position in the event of approaching Spanish ships. However, the swampy and isolated site was plagued by mosquitoes, brackish tidal river water unsuitable for drinking, and offered limited space. Perhaps the best thing about it was that it was not inhabited by Native American tribes that lived nearby. Nevertheless, almost immediately upon arriving, the colony was attacked by the nearby Algonquian tribe. Despite early inspired leadership by Captain John Smith, for the first five years, many of the colonists (and their replacements) died. The very survival of the settlement itself was precarious. During what became called the "Starving Time" in 1609–1610, over 80 percent of the colonists perished. Jamestown would have been abandoned were it not for the timely arrival of a supply mission from London headed by a new governor, Lord Delaware, who brought suppliers and additional settlers, and required a renewed attempt. In the group that almost left was a colonist named John Rolfe, who had untested new tobacco seeds with him. Rolfe's first wife and their young son had already died since he had left London more than a year earlier. The colonists tried many industries, such as silk, wheat, glass, timber, and cotton, but none were profitable enough in export to sustain the colony. However, after colonist Rolfe successfully developed and exported his strains of tobacco beginning in 1612, the outlook of the settlers finally improved with the identification of a new cash crop. Thus, the original Jamestown Settlement became the first permanent English colony to survive in what is now the United States. 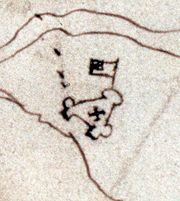 Jamestown followed no less than 18 earlier failed attempts including the famous "Lost Colony" at Roanoke Island in what is now Dare County, North Carolina, and the ill-fated Spanish Ajacan Mission, which had been established by Jesuit priests and located less than 15 miles from Jamestown 36 years earlier. John Rolfe became wealthy and in 1614, married Pocahontas, daughter of Chief Powhatan. This brought several years of peace. Through their son, Thomas Rolfe, many of the First Families of Virginia trace both Native American and English roots. However, at the end of a public relations trip to England in 1616, Pocahontas became sick and died. The following year, her father also died. As the settlers continued to demand more and more land for tobacco farming, relations with the Indians worsened again. Chief Powhatan's brother, a fierce warrior named Opchanacanough became head of the Powhatan Confederacy. In 1619 the first representative assembly in the New World convened in a Jamestown church "to establish one equal and uniform government over all Virginia," which would provide "just laws for the happy guiding and governing of the people there inhabiting." This became known as the House of Burgesses (a forerunner of the Virginia General Assembly, which met in Jamestown in January, 2007). Individual land ownership was also instituted, and the colony was divided into four large "boroughs" or "incorporations," which were called Citties. Jamestown was located in James Cittie. After several years of continued shaky attempts at coexistence, Chief Opchanacanough and his Powhatan Confederacy eventually became completely disenchanted with the English colony and tried to eliminate it completely. During an event which became known as the Indian Massacre of 1622, they attacked the outlying plantations and many communities up and down the James River in a coordinated manner on the morning of March 22, 1622, Good Friday. The attack killed over three hundred settlers, about one-third of the English population. Sir Thomas Dale's progressive development at Henricus, which was to feature a college to educate the Indians, and Wolstenholme Towne at Martin's Hundred, were each essentially wiped out. Jamestown was spared only through a timely warning. There had been no time to spread the word to the outposts, however. Despite the setbacks, the colony continued to grow, and the colonists retaliated. Another large scale attack in 1644 resulted in the capture of Chief Opchanacanough, who was murdered while in custody. Following his death, the Powhatan Confederacy was largely decimated. Most survivors assimilated into the general population or began living on two reservations in present-day King William County, Virginia, where the Mattaponi and Pamunkey reservations continue in modern times. In 1624 King James revoked the Virginia Company's charter and Virginia became a royal colony. Ten years later, in 1634, by order of King Charles I, the colony was divided into eight shires (or counties) in a fashion similar to that practiced in England. Jamestown was now located in James City Shire, soon renamed the County of James City County, better known in modern times as James City County, Virginia, the nation's oldest county. During Bacon's Rebellion in 1676, Jamestown was burned (and later rebuilt). The legislature met first at Governor William Berkeley's nearby Green Spring Plantation, and later at Middle Plantation, which had been started in 1632 as a fortified community inland on the Virginia Peninsula. When the statehouse burned again in 1698, this time accidentally, the legislature again temporarily relocated to Middle Plantation, and was able to meet in the new facilities of the College of William and Mary which had been established there after receiving a royal charter in 1693. Rather than rebuilding at Jamestown again, the capital of the colony was moved permanently to Middle Plantation in 1699. The town was soon renamed Williamsburg, to honor the reigning monarch, King William III. A new Capitol building and Governor's Palace were erected there in the following years. By the early eighteenth century, Jamestown began a period of decline, eventually reverting to a few farms. The period as an occupied settlement was essentially over. During the American Revolutionary War, a military post was used on the island to exchange American and British soldiers. In 1861 the island was occupied by Confederate soldiers who erected a fort near the church. Later in the American Civil War (1861–1865), it was used by Union troops. Late in the nineteenth century, Jamestown Settlement became the focus of historical interest and preservation. In 1893 the first portion of the island was donated to the Virginia Association for the Preservation of Antiquities (APVA) for that purpose. A seawall was constructed which preserved the site where the remains of the original "James Fort" were to be discovered by archaeologists of the Jamestown Rediscovery project beginning in 1994, almost a century later. In 1907, the Jamestown Exposition to celebrate the three hundredth anniversary was held at a more convenient location at Sewell's Point, near Norfolk. By the 1930s, the entire island was under protective ownership, and the Colonial National Historical Park was created by the National Park Service. In 1957, the Jamestown Festival, a celebration of the 350th anniversary, was held at the original site (and nearby). Now linked by the newly-completed bucolic Colonial Parkway with the other two points of Virginia's Historic Triangle, Colonial Williamsburg and Yorktown, it was a great success. The tourism became continuous after 1957. The name "Jamestown Settlement" currently is used to describe the Commonwealth of Virginia's state-sponsored attraction which began in 1957 as Jamestown Festival Park, which was created for the 350th anniversary of the original settlement. Located near the entrance to Jamestown Island, it includes a recreated English Fort and Native American Village, extensive indoor and outdoor displays, and features the three popular replica ships. It was greatly expanded early in the twenty-first century. On Jamestown Island itself, the National Park Service operates Historic Jamestowne. Over 1 million artifacts have been recovered by the Jamestown Rediscovery project with ongoing archaeological work, including a number of exciting recent discoveries. This page was last modified on 20 March 2018, at 16:45.